Like the other two calendars for this year, the Star Wars Advent Calendar cover is rife with spoilers! 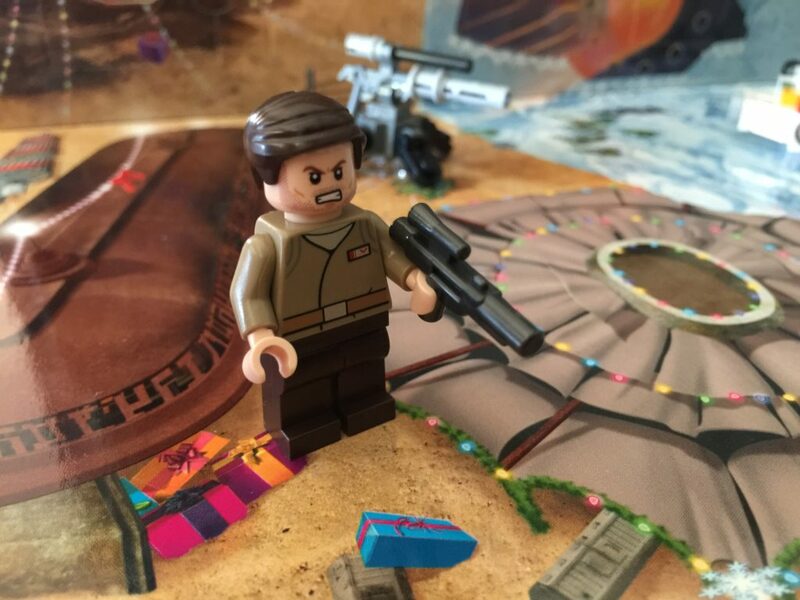 C’mon LEGO, we want some surprises! It is great to see that this year is chock full of some of the new characters and arsenal from the new Star Wars movies. I’n honestly not a fan of the display base this year. It’s far too busy, with Starkiller Base and Jakku both competing for space. I like to display my builds with the background in mind, and it’s very difficult to do this year. Sure, it looks eye catching, and there’s loads of detail, but there’s just too much. We’ve started off with something a little more on the obscure side for me! This is The Ghost, the main rebels ship from the Star Wars: Rebels series. I’ve never seen the series, and I had to do a little research to find out what ship it was, so I don’t know much about it. From a LEGO point of view though, it looks good. Some basic SNOT thrown in, and it looks quite similar, with the cleverest section being how the engines were replicated. Back in 2014, LEGO released 75053 The Ghost, so it’s not new to the LEGO scene. All in all, a solid start. 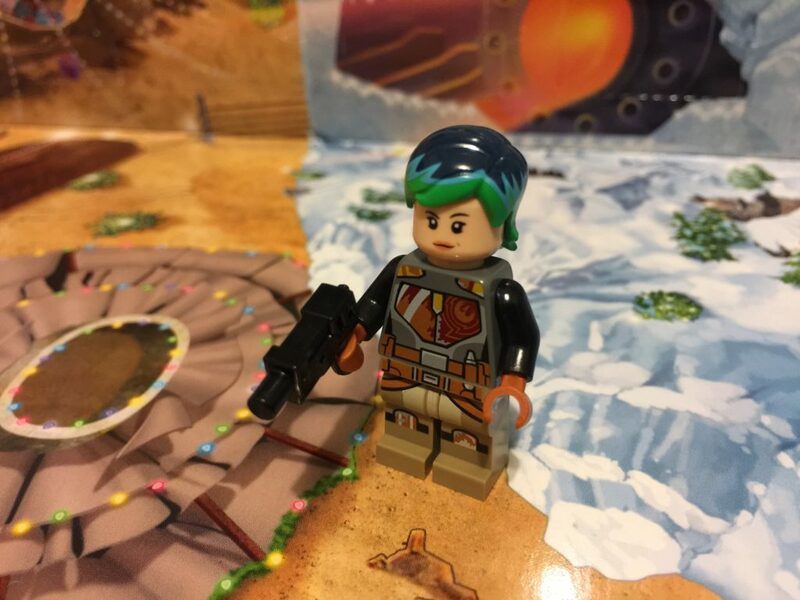 Day two sees us sticking with Star Wars Rebels, and we get Sabine Wren! As I mentioned for Day 1, I’ve not seen Rebels, so I had to do a bit of researching for this one. Sabine is a main character in the series, and is Mandalorian, so she’s pretty fearsome! 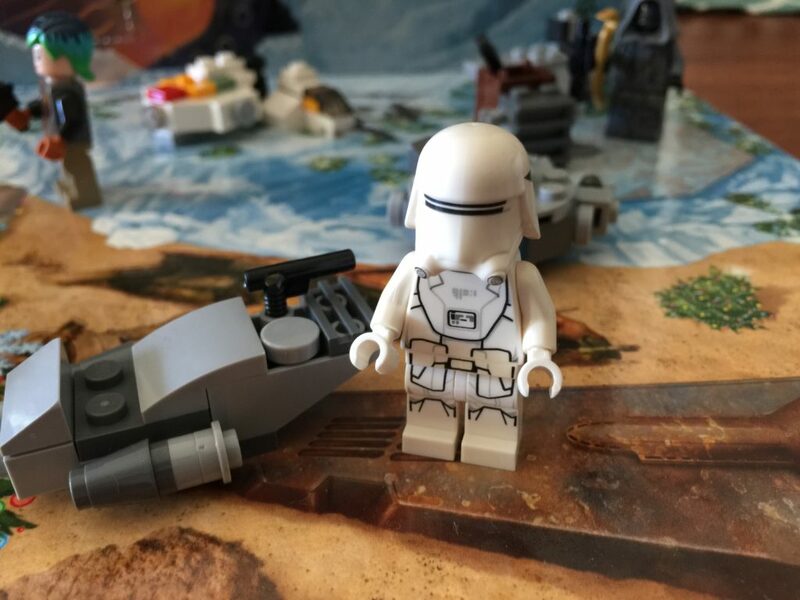 Day 3’s model is yet another Rebels build and is very closely related to The Ghost from Day 1. The Phantom is the shuttle craft from The Ghost. It’s an interesting build, and while would be recognisable for Rebels fans, it wasn’t for me. To get the angles right at this scale would be a task and a half, so we’re stuck with this one. No special parts inclusions here at all. I do like the clip underneath the cockpit as the cannons. 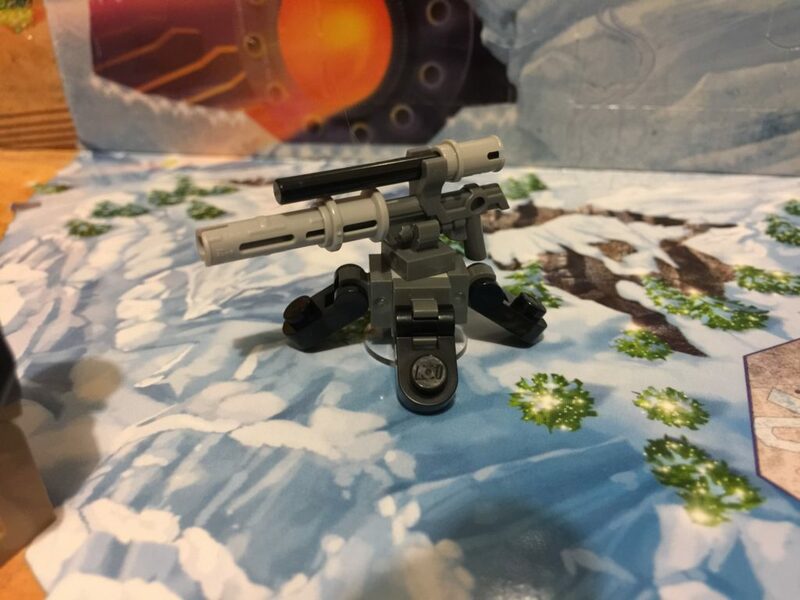 The fourth build is a mounted blaster cannon, and I reckon it’s pretty great! It’s not a special or unique build, but I really like the look of it. It’s at a good height for Sabine to shoot with too. I also like the 1×1 plates with bars as feet. They’ll come in handy! 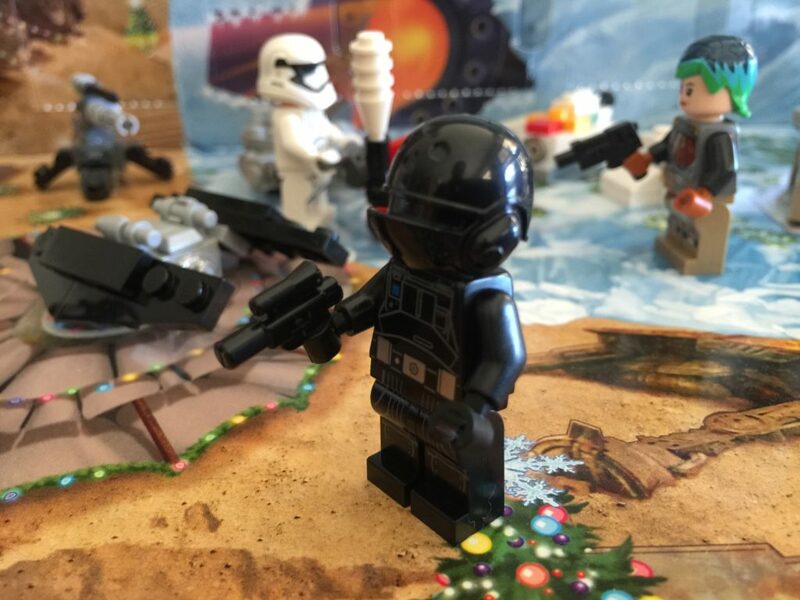 Today’s gift is a Resistance Officer. We’re out of the Rebels series and are into The Force Awakens! I believe this is a very generic character, but he does have a double sided head, like Sabine, with a stern look and an angry look. Nothing all that rare today with the parts, but Sabine now has a friend! EDIT: It turns out that it’s not a generic character, but Major Taslin Brance! Now I’ve learned something. Today’s build is a fantastic microscale version of a First Order Transporter. This model is brilliant. It’s instantly recognisable, and is well represented in the smaller format. The colouring is boring, but it’s accurate. 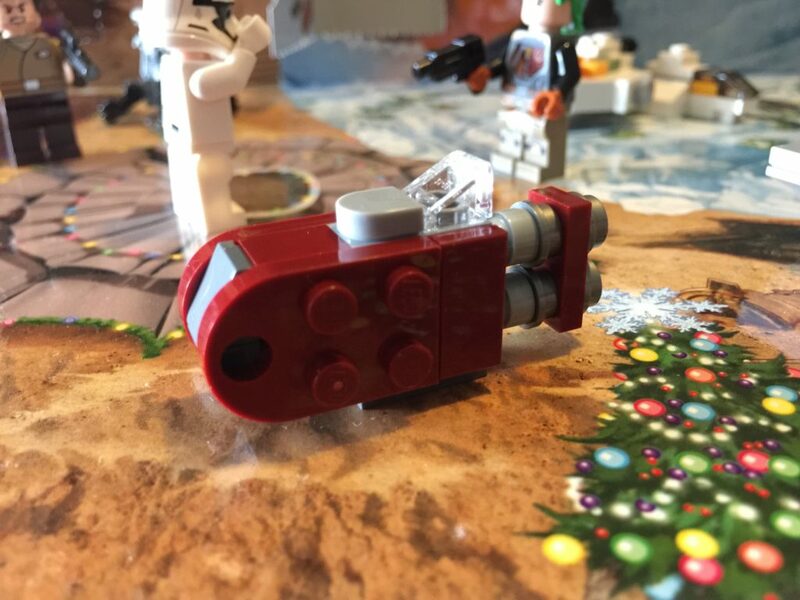 I always love the microscale vehicle builds in the Star Wars Advent Calendar, so I’m excited to see what comes next. By the looks of the spoilers on the box, it’s going to be good! This one is a bit of good and a bit of bad. It’s great getting a First Order Stormtrooper. They’ve only been in 10 sets so far, so while not rare, they’re not exactly common either. The printing is fantastic – it’s very detailed. What I’m not a fan of is that he’s got no weapon! Ok, Stormtroopers are well known for being essentially useless with a blaster, but that’s not an excuse to not give him one! 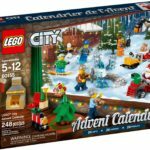 It’s a serious missed opportunity, and one I’m very surprised about from what is usually the best Advent Calendar of the year. After our First Order Stormtrooper was weaponless yesterday, today we get to rectify that, with a supply box! It’s a very simple build, and comes with a medium blaster and spanner. I don’t mind the look of it – I don’t have many of the 1x2x2 ladders, so that’s a welcome addition. There’s two clips for storage, as well as the box itself. I’m very pleased about today’s build – it’s Rey’s Speeder, and it’s a beautiful rendition of it! Instantly recognisable, and the dimensions are near spot on. It’s a very clever use of parts. This is the standout favourite so far. Remember in The Force Awakens when Rey and Finn are fighting off the thugs on Jakku? Well, they’re Unkar’s thugs, and this little guy is one of them! Unkar Plutt is the big grumpy junkboss that Rey has to deal with. 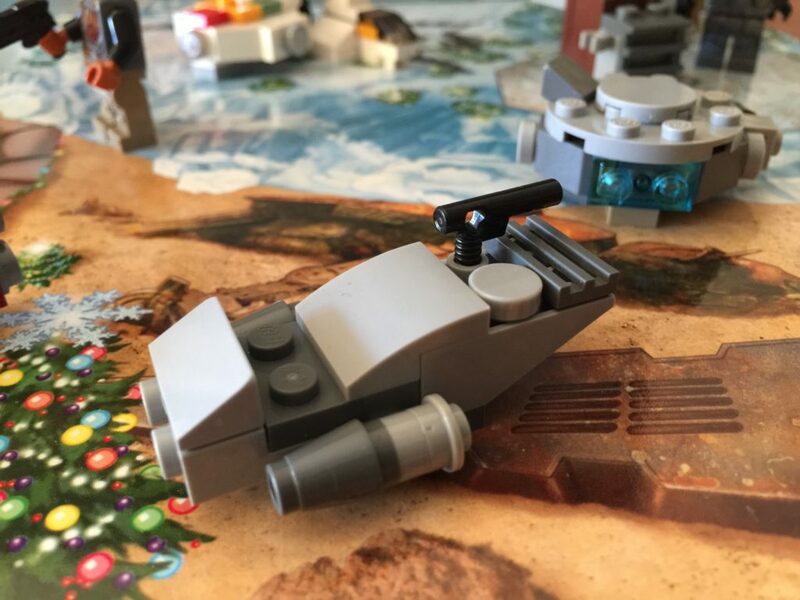 This thug has been seen before, in 75099 Rey’s Speeder, but that’s it. It’s awesome that he’s here in this set too. The hood’s also been seen in 71042 Silent Mary, and the gold crowbar in a few more. He’s got some beautiful printing front and back, too. I’m very happy! We’re 10 days in, and it’s looking good! Bring on Day 11. 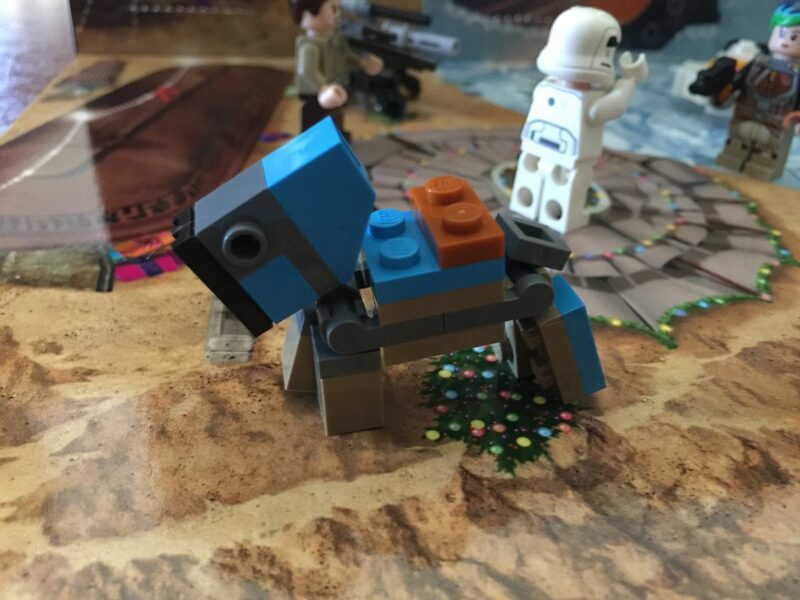 We’re still sticking with The Force Awakens today, with a very cute little luggabeast! These little guys aren’t actually that little! They’re a bit cyborgish, with the head being tucked away under armour and instruments galore, to help find the good stuff for salvage. 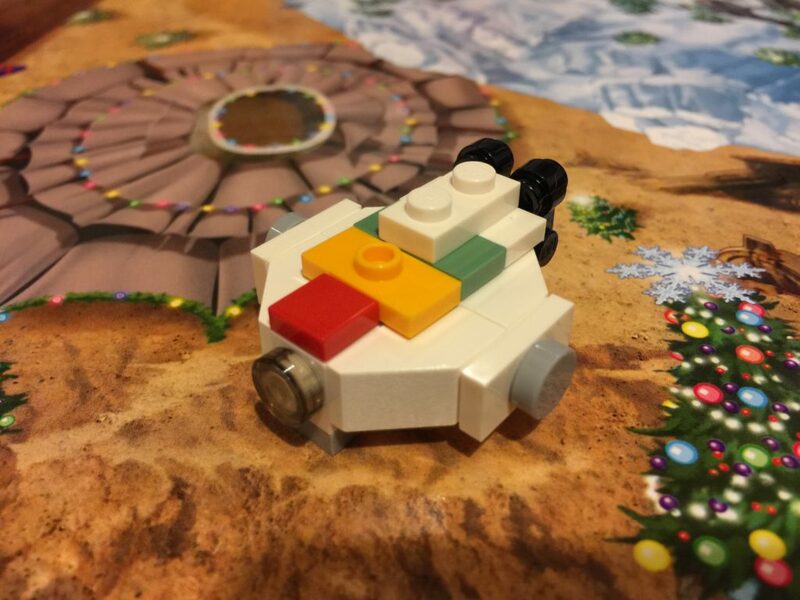 While it’s new at this scale, the luggabeast has been seen in LEGO form before, with 2016’s 75148 Encounter on Jakku. I really like this little guy. He’s adorable, and is recognisable too. If there’s one ship that the majority of people will recognise from Star Wars, it’s this one – the Millenium Falcon. It’s great that we get a brilliant looking version in the calendar this year. This build looks excellent. The shape is awesome, and I love the use of the trans grey cone for the cockpit, although the cheese slope on the top as a radar dish just doesn’t work for me. It’s too big and at the wrong angle. At the rear you’ll find a 1×2 trans blue plate for the thrusters – it’s perfect! Big fan of this one today. We’ve officially hit half way! Ok this one took me a bit of researching to figure out. 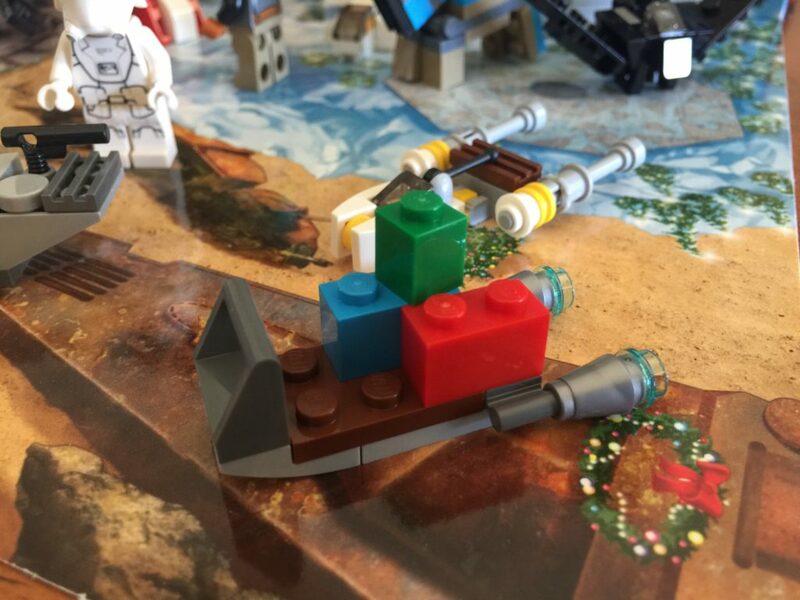 It’s a little odd, but apparently it’s a First Order Snowspeeder. These were never in The Force Awakens, unless you watched the deleted scenes from the DVD. 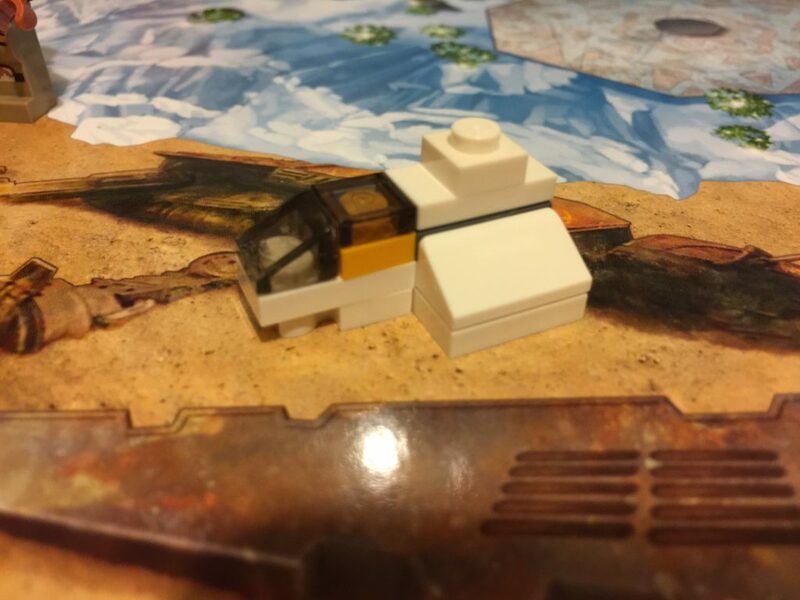 These have been represented in LEGO before, in 2015’s 75100 First Order Snowspeeder (EDIT: plus another one I missed – see Day 14). It’s a little bit of an odd representation in microscale, and I’ve also taken a photo of it from the back, so that doesn’t help. The parts are pretty ordinary, too. This is more like it! 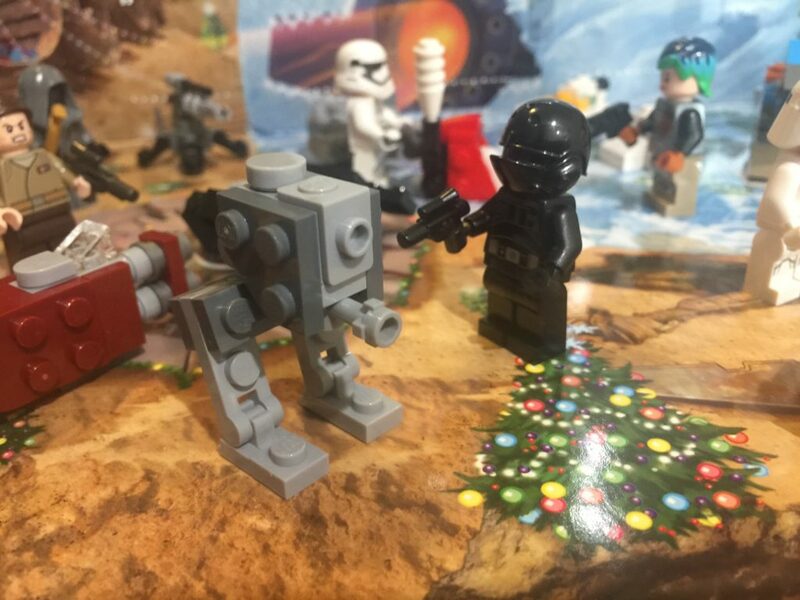 To go with yesterday’s Snowspeeder, we get a First Order Snowtrooper! The printing on this minifigure is once again great, with a high amount of detail visible. 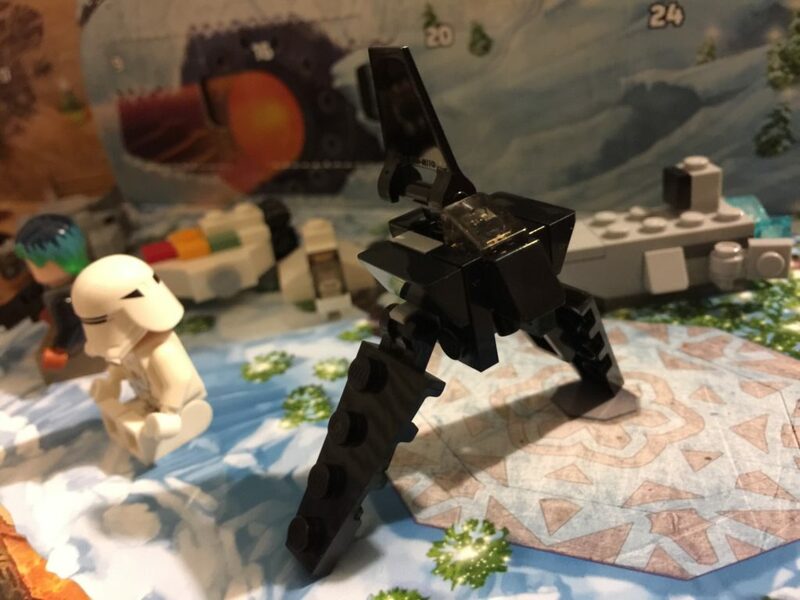 The First Order Snowtrooper is still quite rare in LEGO, having only appeared in two other sets. 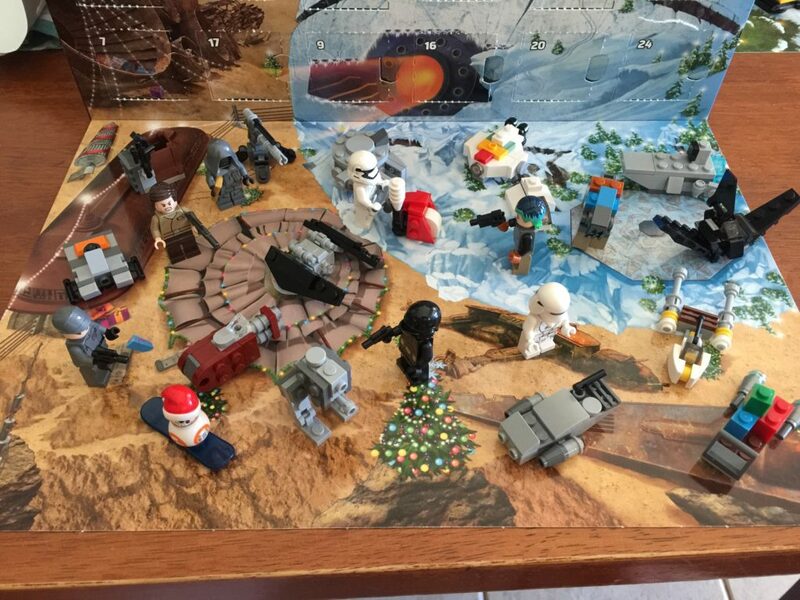 The 2015 set I mentioned yesterday, and 2016’s 75126 First Order Snowspeeder microfighter, another retired set. 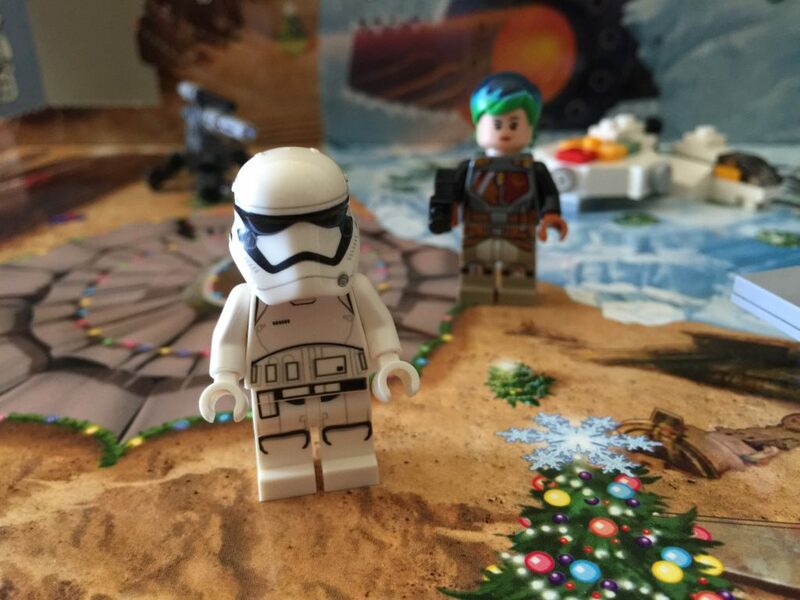 If you are lucky enough to have these two, then you’ll have a few Snowtroopers already, but if you’re like me, you’ve now got just one! It’s a shame he doesn’t have a blaster, but maybe he can share with the Stormtrooper from Day 7. This is a very strange inclusion. As of last night, I’ve seen all the Star Wars movies, and I don’t remember a snowblower in them. 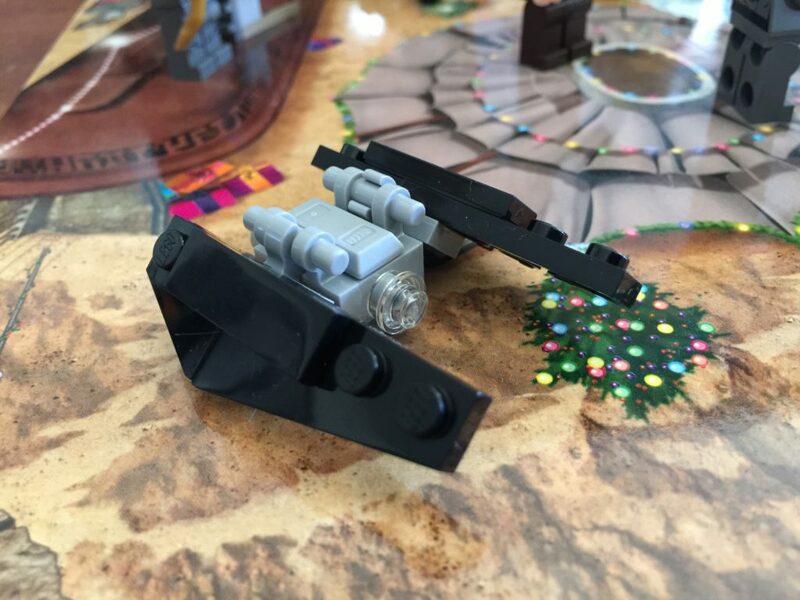 Sure, it’s a nice looking model, and the 2×2 wing plates in red are a good inclusion, but it’s not Star Wars! 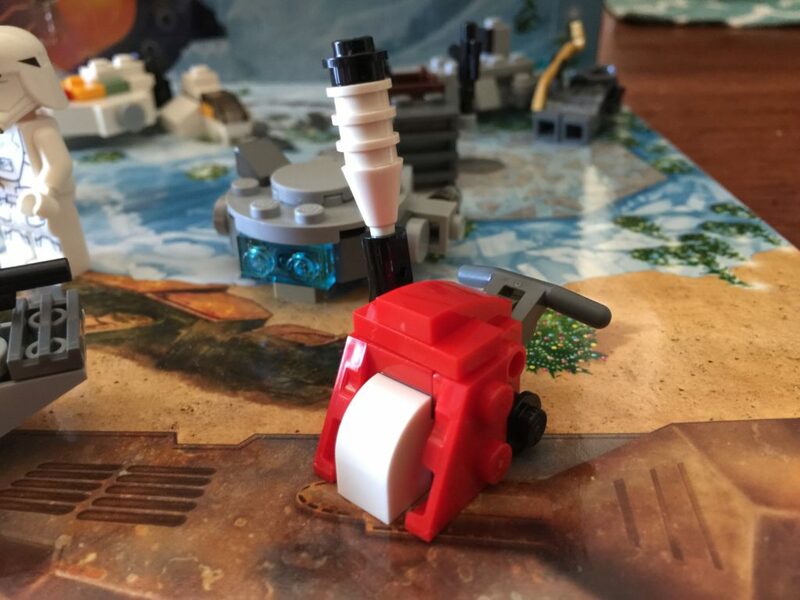 There are countless options for inclusions with this set, so why a snowblower? It’s strange. I really hope there’s no more generic inclusions like this. We’re back to the Star Wars movies today, and into a new one with Rogue One! This is Director Orson Krennic‘s imposing Imperial Shuttle. This one was quite tricky to build – the instructions are not particularly easy to see, but after looking at the parts available it started to make sense. I like this one, but it’s a shame the 1×2 plates with clips are in grey, not black. 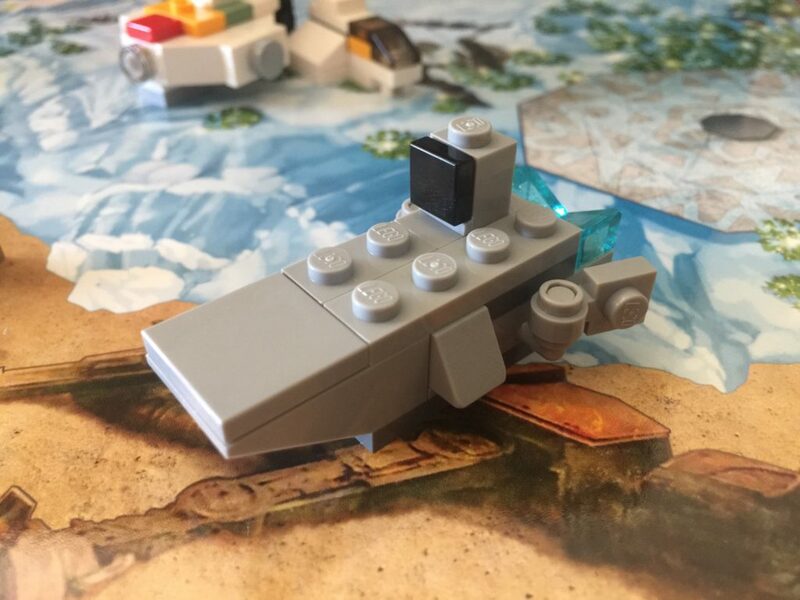 This craft has been seen in LEGO form before, with 75156 Krennic’s Imperial Shuttle. It looks pretty good in microscale! We’re sticking with the enemy today, with a surly looking Imperial Officer. 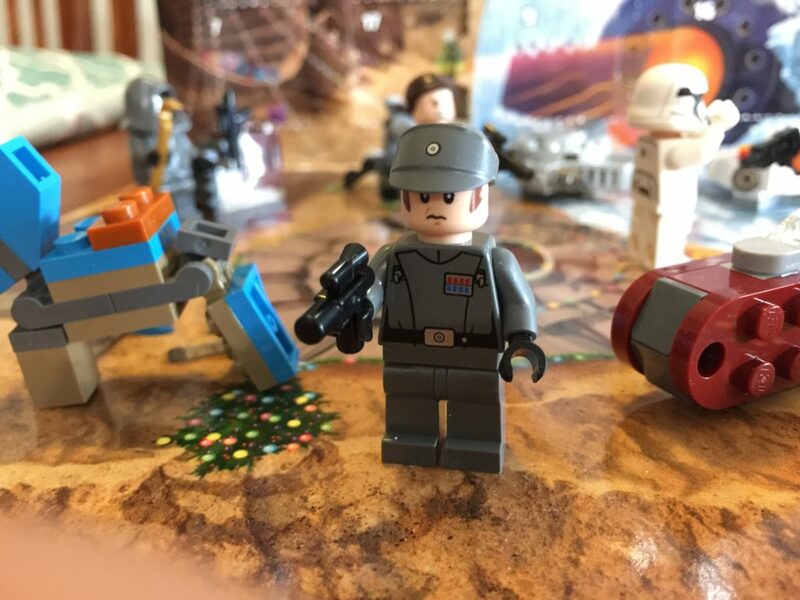 This torso and hat haven’t been seen in any set before, so we’ve got an exclusive minifigure at last! 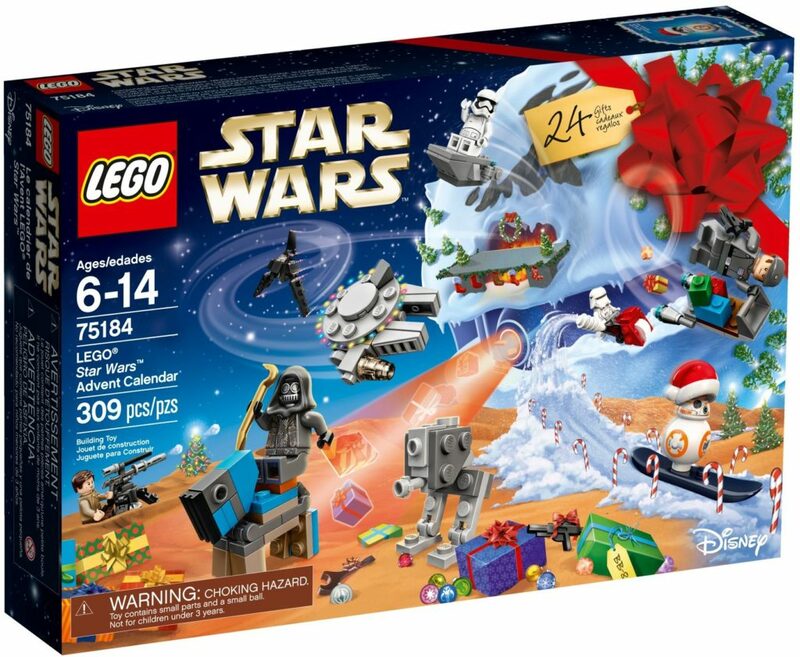 The head has been seen in two other sets before this – last year’s 75159 Death Star and 2014’s 75055 Imperial Star Destroyer, but that’s it. He’s got a blaster, unlike his other bad guy buddies, so he’s ready for some action. I like the sneer on the face, although those sideburns are distractingly large! Today’s build is absolutely fantastic. It’s one of my favourite Star Wars craft, the Y-Wing Starfighter, or Y-Wing Bomber. 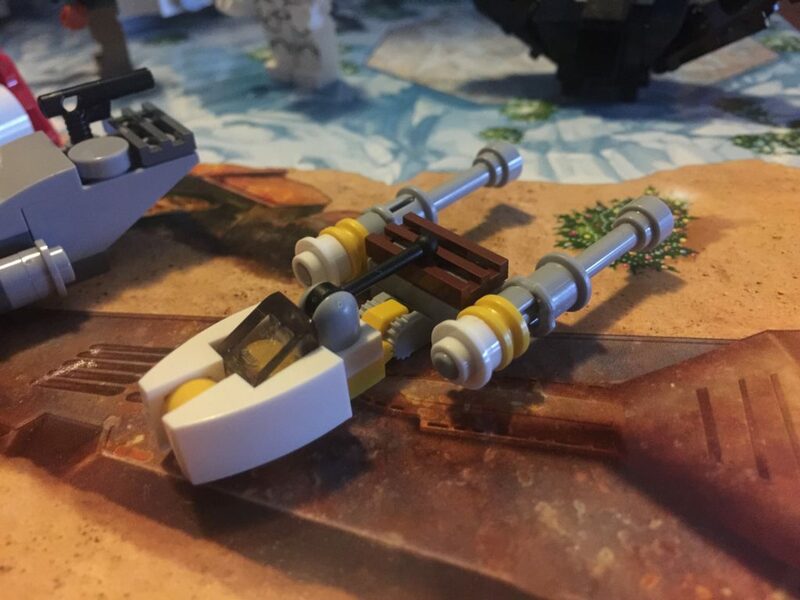 The Y-Wing has been seen in LEGO many times before over the years. 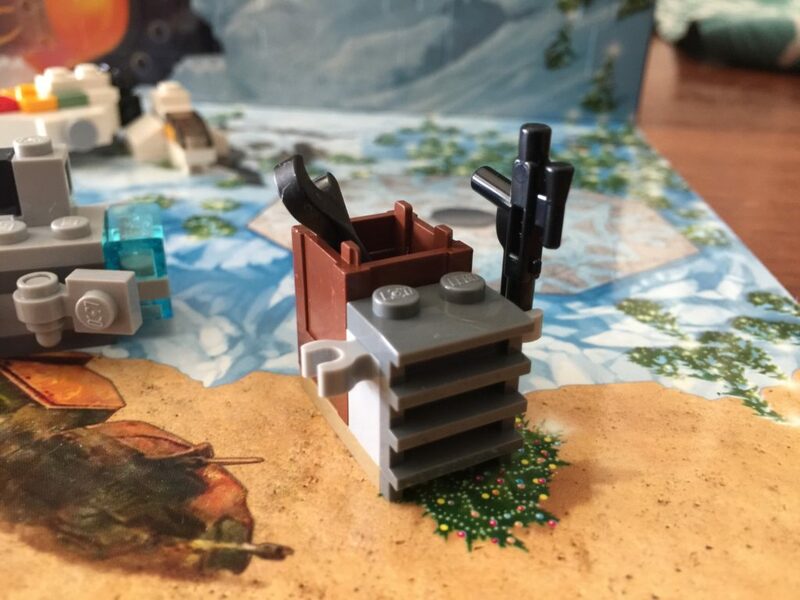 It’s not the first time at this scale, as it has been seen in the 2014 Star Wars Advent Calendar, but it’s a monumental improvement. It works! It’s an excellent representation of this old workhorse. The scale and proportions are spot on. This is my new favourite build for the set. I love it! We’re obviously sticking with Rogue One today, as we get a TIE Striker – unlike the TIE Fighters, which were used mainly for space battles, the Striker was utilised in atmospheric battles above ground. This is a difficult shape to get right at this scale and I reckon they’ve done pretty well considering. The hinges are a little unsightly, and the cockpit is a little off, but for the most part, it’s good. It’s definitely recognisable, so that’s a great start. It’s another cracker of a build today, with a microscale combat assault tank! 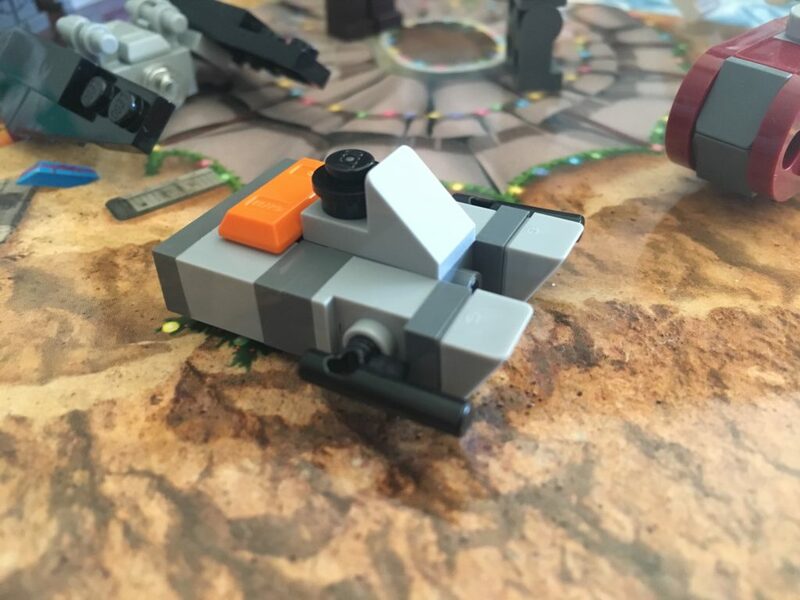 This is another Rogue One vehicle that has been very well represented in this scale and it’s also another vehicle that has been seen in LEGO form in 75152 Imperial Assault Hovertank. Four days left – I wonder what’s coming? 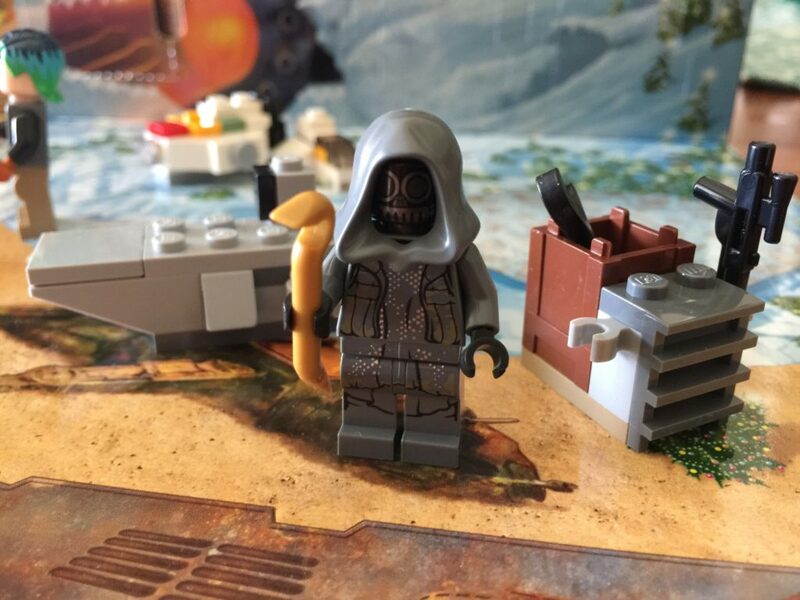 What we get is another minifigure. It’s another bad guy – one of the Imperial Ground Crew. These guys held down the fort on Scarif and other places around the galaxy. He comes with a small blaster and also has some pretty nice printing on his torso and legs. 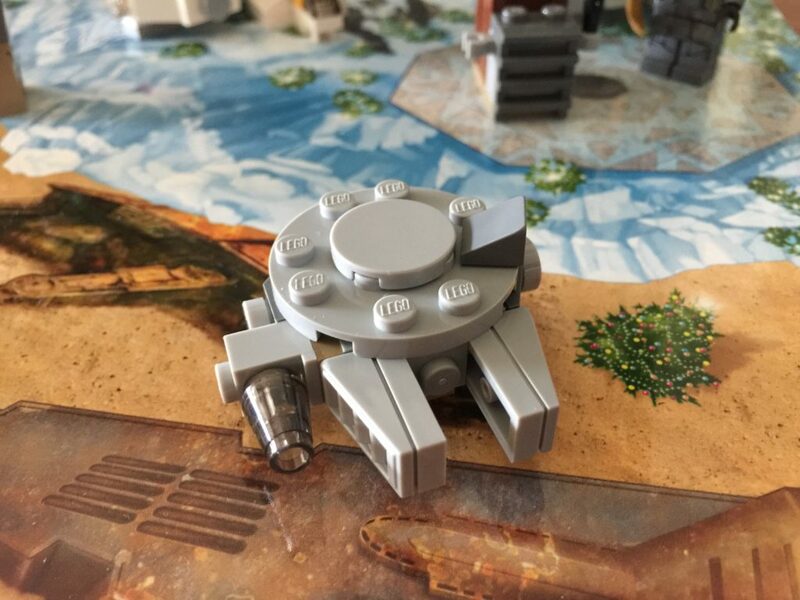 He’s been seen in two other sets before this one – 75154 TIE Striker from last year and this year’s 75171 Battle on Scarif (which makes sense). It’s been good to have some of the rarer minifigures, but there has been a lot of the baddies. We want some good guys to balance it out! 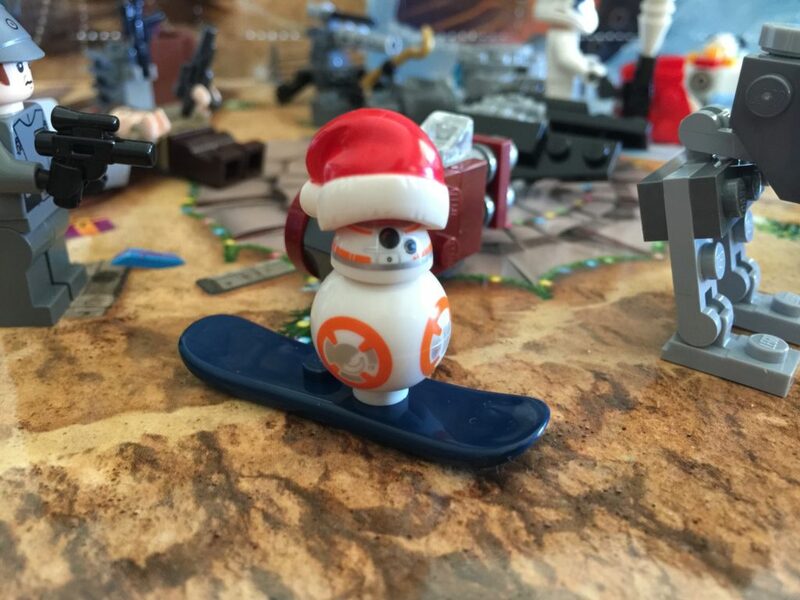 It’s the final day of our Star Wars Advent Calendar journey, and we get (with absolutely no surprise at all) a very festive BB-8 on a snowboard. As hilarious as this looks, with the hat almost hovering on BB-8’s head thanks to a 1×1 round plate, it’s a really good inclusion. 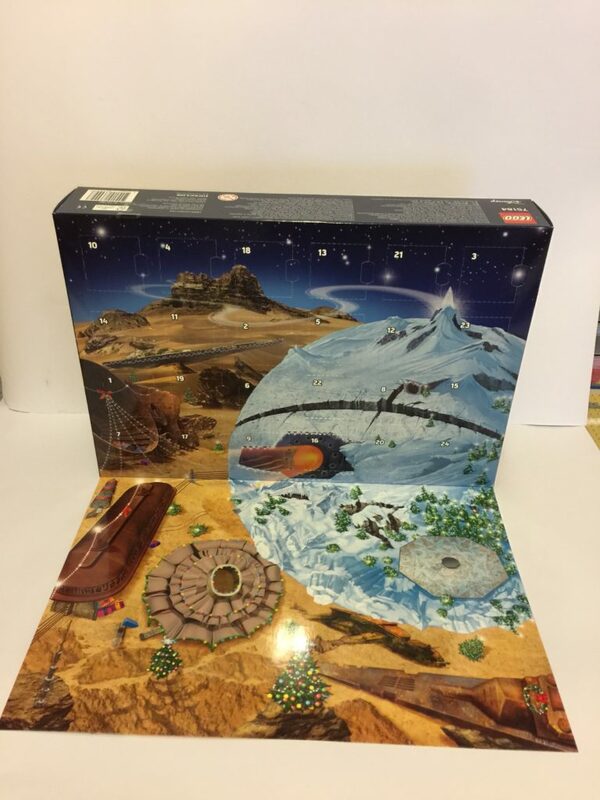 As many of you will be aware, the Advent Calendar is really the only time I pick up a Star Wars set, so I don’t have any BBs yet! He’s appeared in eight other sets already, across all price levels. While BB is almost common now, the snowboard isn’t. It hasn’t been seen in this colour since 2015’s 10249 Winter Toy Shop from the Winter Village theme. Another good inclusion! That’s all there is for the Star Wars Calendar for 2017 and it has been good! I reckon this is the best one we’ve had. There have been some superb small scale builds, and some good minifigures, with seven in total, plus BB-8 today. My favourite build is easily Day 18’s Y-Wing, with the least favourite build being the supply box from Day 8. The vehicle builds this year have been excellent and I’m very excited about next year. This is the best advent calendar of the year for me. What are your best and worst for the Star Wars calendar for 2017? Let me know below.